Beautiful apartment with terrace on the second floor, very sunny and with fantastic views of the sea and the beach. The apartment is divided into three areas, the living room, the dining area with open concept kitchen, and a comfortable bedroom with a lot of storage and a floor to ceiling sliding door. The sofa turns into a double bed if you are coming in a party of four. The kitchen is right in front of the terrace, devided with glass fordable doors so you can unify both spaces. And best for last! An old staircase leads us to the Boulevard in just a minute walk. If you plan to come by car, there is usually parking spots on the same street of the apartment's building, to which you arrive through the old stone stairway that go along the building's side facade. 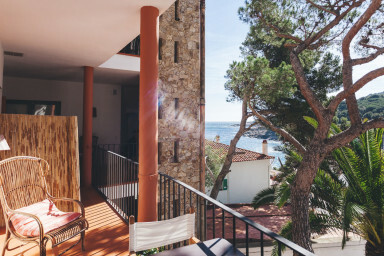 Tamariu is 126 kilometers away from Barcelona and is one of the 3 beaches of Palafrugell along with Llafranc and Calella. At night, there are diverse pubs and bars where the vacationists gather to have a drink and chat with background music and nice ambiance. We recommend to come with a car if you want to move around and get to know the surroundings, as the public transportation is not very fluid and frequent. T4 room has a good access to terrasse, where there is a nice view to the village and a small part of the harbour. All furnitures are from IKEA, but kitchen could be better equipped (e.g. not enough knifes, glasses, dishwasher is missing). Beach is close, but this access is not recommended to elder people due to stairs (approximately 15 meters altitude difference) leading to the beach. Unfortunately, there is only one set of keys for each apartment, so it is almost impossible to come back from the beach/village separately, especially to get through the main entrance to the building. Our washing machine was not clean and we had to clean ourself the washing powder tray as it was full of fungi (totally black). Parking is available on the street in front of the building and with luck you can park just next to the building. Despite staying for two weeks and paying full price of two weeks, no towel or bed sheets change was done for us. Enjoyed cooking in the well equipped kitchen and sitting on the balcony enjoying the views. We loved walking 5 minutes to the beach, restaurants and supermarkets. Also enjoyed Parafrugell's food market, art gallery and cafes. Walked along coastal path to a secluded beach. Me encantó estar en este apartamento, está muy cerca de todo y a la vez es muy tranquilo. Es genial disfrutar de las vistas a la bahía y al jardín con las palmeras y los pinos. Los dueños fueron muy agradables, la verdad es que lo pasamos muy bien. Hem passat 15 dies i hem estat molt a gust! Totalment recomanat! !